Love Me Again was one of the biggest hits in 2013, it performed extremely well all around the world. It is actually a very simple song, in that it only has 4 chords: Gm-Bb-Dm-C. The song is in the key of D minor, so the chord progression is 4-6-1-7, not very common. Our tutorial on Love Me Again will cover how to play the entire song on guitar, including the intro, that radar-like riff, the chorus, verse and bridge. It’s all very similar, but there are a few intricacies you’ll want to be mindful of. Oh, and before you start learning Love Me Again, please listen to the song, so you have its rhythm in your ear. So first off, we’ll learn the chords you’ll be using throughout the song. We’ll first learn the barre chord version, as well as the capo version in case you’re not that proficient with barre chords yet. 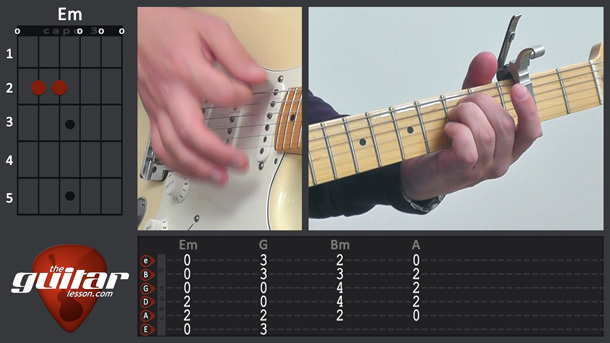 If you chose the later, you’ll need to place your capo at fret 3. Once you learn the chords and are comfortable with changing in between them, you’ve pretty much learned the entire song already… Or at least the intro, since the intro is basically single strums at each chord. Next, we’ll learn the little riff they play after the intro, it’s very characteristic of the song. It really reminds me of a radar blip, how about you? We’ll learn the single note version of the riff, as well as an octave strumming version, which will really advance your strumming skills, since you’ll be doing a lot of muting not just in between the strums, but during them as well. You’ll see what I’m referring to in the lesson. Next, we’ll learn the main strumming section of the song, with both the capo, and barre chords as well. I actually prefer the barre chord version, since I can add a few muted strums in between the chord changes, which adds a nice grove to the song. Love Me Again was written by John Newman and Steve Booker, and was released as a digital download in May, 2013. It was Newman’s biggest hit to date, as he appeared on the music scene in 2012 at the age of 22. The song became the lead single for John Newman’s debut album, Tribute. Love Me Again was a huge hit all across the world, receiving multiple awards and nominations of Single of the Year in several countries. The detailed list of rankings can be found on the song's Wikipedia page. Sorry, but you've reached a premium content area. The download of the Love Me Again tablature file is only available to premium members. Sorry, the same goes for the backing track. To download the backing track to Love Me Again, please log in and revisit this page.